VIETNAMESE MEDIC ULTRASOUND: CASE 462: LIVER ABSCESS POST ENDOSCOPIC CHOLECYSTECTOMY, Dr PHAN THANH HAI, MEDIC MEDICAL CENTER, HCMC, VIETNAM. CASE 462: LIVER ABSCESS POST ENDOSCOPIC CHOLECYSTECTOMY, Dr PHAN THANH HAI, MEDIC MEDICAL CENTER, HCMC, VIETNAM. Man 67 y o, emergency operation by acute necrosis of gallbladder by stone one week ago, still pain at Murphy area. WBC = 12k with neutro 90%, CRP= 100ng/mL. Abdomen ultrasound detected one mass # 5 cm at the bed of gallbladder. Mass has got fluid content and white structures inside with very strong shadowing and air in formatting an abscess. No dilatation of the biliary system. US 1: subhepatic abscess with strong shadowing in abscess. US 2: umbrella sign of the shadowing. US 3: elatoscan shows this structure is very hard. MSCT: CT 1: abscess with air and fluid filling at the bed of gall bladder which had been removed of GB. CT 3: frontal view of the abscess. Radiologist reported textilloma in suspection. 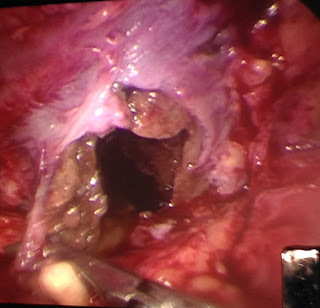 Laparoendoscopy detected an abscess in liver at the bed of gallbladder necrosis and no textilloma.